In this circuit you will work with a potentiometer. You will learn how to use a potentiometer to control the brightness of an LED by reading a sensor and storing its 0--1023 value as a variable, then using it as a brightness level for the LED. 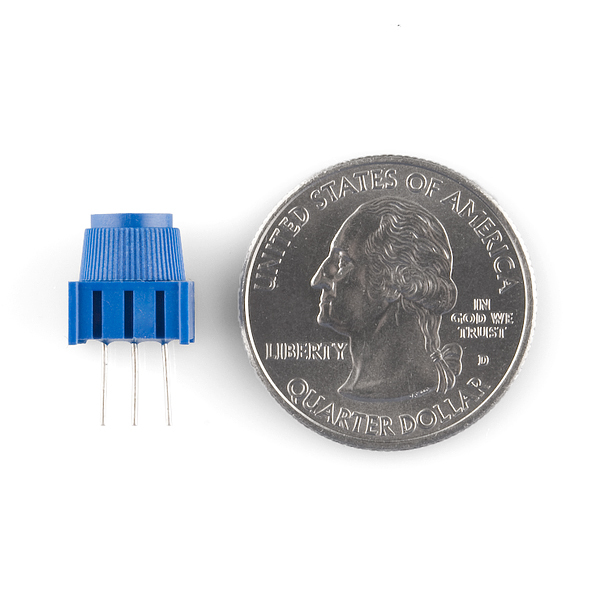 A potentiometer is a resistance-based analog sensor that changes its internal resistance based on the rotation of its knob. The potentiometer has an internal voltage divider enabling you to read the change in voltage on the center pin with a microcontroller (the micro:bit). To hook up the potentiometer, attach the two outside pins to a supply voltage (5V in this circuit) and ground. It doesn’t matter which is connected where, as long as one is connected to power, and the other to ground. 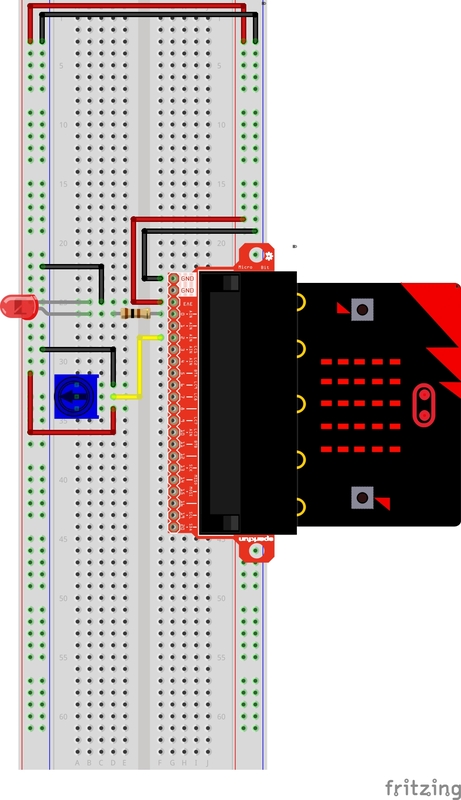 The center pin is then connected to an analog input pin so the micro:bit can measure the change in voltage. When you twist the knob, the sensor reading will change! Note: The potentiometer included in the kit has three marks on it that will help you figure out which breadboard rows the pins are plugged into. Note: The full-sized breadboard power rails have a break down the middle. If you end up using the lower half of the power rail, you will need to jump between the upper end and lower end. In this program you are reading the voltage from the potentiometer, which is 0 to 3.3 volts on pin 2. The micro:bit reads that value as a 10-bit number, which is a value range from 0 to 1023 using the call pin2.read_analog(). We are saving that number to a variable called potVal. As with the analog read, the analog write deals with a range of values, but instead of reading a pin as an input, the line pin0.write_analog() outputs an analog value to a pin. We see this as a brightness range with this LED, but it could be a tone from a buzzer, a motor speed, etc. We set our analog output to the variable we stored the potentiometer value in. A “variable” is a placeholder for values that may change in your code. You can create a variable by simply typing a name and setting it equal to what you want. Python is a dynamically typed language. This means the type of variable is determined at runtime. So you do not need to worry about declaring your variable type. You should twist the potentiometer. You will notice that the LED will get brighter or dimmer based on the position of the potentiometer. If you turn the potentiometer all the way one direction, it will be fully on, and the other end will be fully off. This is most likely due to a slightly dodgy connection with the potentiometer's pins. This can usually be conquered by holding the potentiometer down or moving the potentiometer circuit somewhere else on your breadboard. Make sure you haven’t accidentally connected the wiper (center pin), the resistive element in the potentiometer, to a wrong pin! LEDs will only work in one direction. Double check your connections.